Two suspects were taken into custody near Avalon Boulevard and 84th Street in the Florence area of South Los Angeles Friday, June 26, 2015. SOUTH LOS ANGELES (KABC) -- Two suspects who led Los Angeles Unified School District police on a high-speed chase were taken into custody in the Florence area of South Los Angeles Friday. The chase began near Manchester Avenue and Avalon Boulevard when police attempted to stop the suspects who were driving a stolen Audi. The driver traveled at speeds as high as 75 miles per hour through residential streets, and blew past several red lights and stop signs. At one point, the driver drove on a sidewalk. 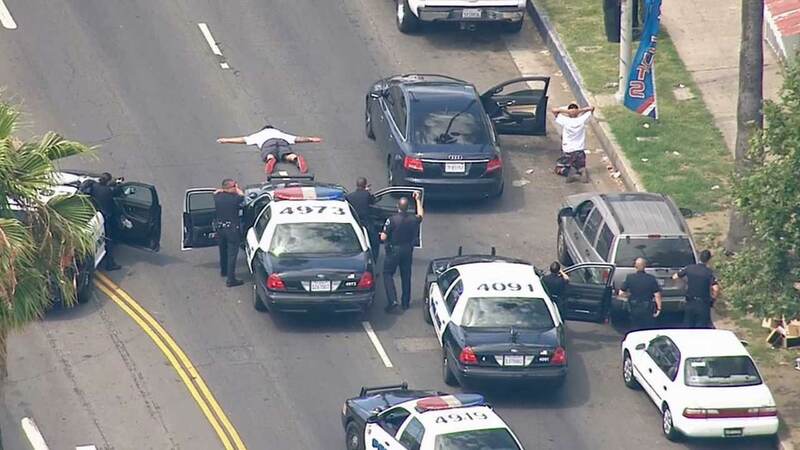 The driver and passenger exited the stolen vehicle with their hands up and surrendered to police near 84th Street and Avalon Boulevard at about 2:40 p.m.